Iam sharing this startling obesity map following trends from 1985 to 2010 with my readers because I want to know what you think. Obesity is such a serious problem in America that it has turned into an epidemic. For me “skinny” or “beautiful” is not about the insane rail-thin standards we see in the press so often, it’s about being a healthy weight for the quality of life, pure and simple. 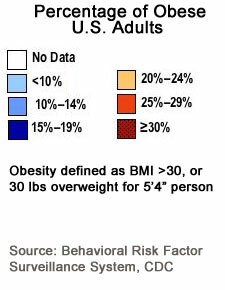 In my mind, there are many factors that cause people to become obese. Many of them are linked to emotional states, economic problems, level of education, and family upbringing. As a person who has struggled with weight gain my whole life, I’m curious to know what my readers and other bloggers think. What is your personal experience and how have you found ways to cope (or not). With drugs out there like Alli, will fighting fat be as easy as popping a pill? Is anti-fat medication really the way to go? Why do you think we have become the fattest nation and what can we do about it? It’s simple math, the calories we consume and the calories our bodies do not burn off is stored as fat. The next decision we can make are how to spend those calories. We should take charge of our decisions, and not let bombardments from everything we see make it for us. A general simple rule is,if you want to be 135lbs. for a woman then multiply 135×10=1350 calories allowed per day, for a man if you want to be 189 multiply 189×10=1890 calories allowed per day. Choose foods that are good for you and have plenty of vitamins and are also delicious. we want to take our vacation! We should choose what is good for us when it comes to food. Those are great tips and we also have to keep in mind that besides the calorie count you gave for basic body weight maintenance – exercise, activity level, and the sorts of foods we consume play a large role in our weight and overall health. I love your comment about choice, being healthy does have a lot to do with choice regardless of heredity or body shape. If to speak about personal experience, I had the greatest weight loss just using… breathing exercises from yoga. It was a big surprise and a miracle for me. I lost 27 pounds in the 1st month and 12 in the 2nd – I didn’t use any pills or dieting. After that my eating habits started to change with no efforts from my side. But to be correct I was not an obese person, just overweight.